A high quality sleeping bag for camping, house guests and a range outdoor activities. 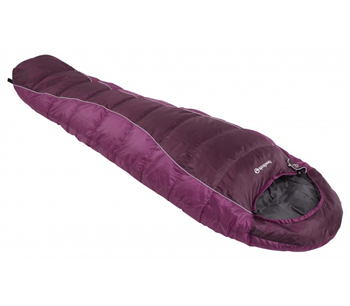 This 2 season sleeping bag comes with a 2 season rating, making it perfect for summer use in the UK, and it's comfort temperature range of +5 to +18°C will ensure you keep warm during the night. Inside the sleeping bag you'll find a full length zip baffle and adjustable shoulder baffle, both designed to keep cold air out and body heat in! The sleeping bag's fleece foot warmer also helps to keep you nice and cosy on an evening, and is a handy addition for anyone who feels the cold easily. The sleeping bag also features a base pocket, located at the foot of the sleeping bag, which is big enough for valuables and other small items. Supplied in a compression bag to make it nice and compact for storage and carrying. Comfortable, dependable and value for money. The Challenger range is bursting with first class features that you would expect from Sprayway. designed for summer use through the 350 which is an excellent 3 season bag perfect for Scouts and DofE participants.